I’m really, really out of practice with Konad so I decided to have a little go at it this evening. This is 2 coats of China Glaze Sugar High, and the design is from plate M64 stamped with Color Club Dark Romance. 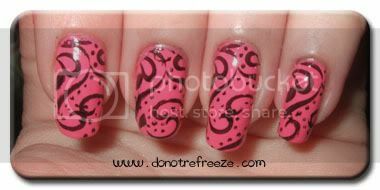 But, I keep my nails a lot longer now than I used to when I constantly wore full-nail Konad designs so I had to try double stamping! I deliberately picked that design ’cause it’s kinda ‘open’ at the end if you see what I mean – I wanted to see if it looked alright plain before I committed myself to double stamping. It didn’t look too bad I guess, but I decided to try anyway. What’re you wearing on your nails at the moment? That came out beautifully! All of your hard work certainly paid off with this one. @Rachel: Oooh sounds fun :D Your prize is on it’s way to you by the way! @Laura: Thank you very much!